It is a bit surprising that a Ruddy should be so seminal a species for my carving. Ruddies are not common on Long Island. You can find occasional pockets of them, with maybe a few dozen or even hundreds, but usually on fresh water – I only rarely have seen them out on the tidal bays. Also, I have never shot one. I have tried only a couple of times, but I could never get them to really fly. I have even chased them under power just to see what they would do – and they would always rather dive or, at best, run along the surface with those enormous paddle-feet, never quite offering a “sporting” target. So, I have “counted coup” on this species. Actually putting each of the Atlantic Flyway denizens in the bag has never been on my “to do” list. However, the image of the Ruddy is burned into my mind’s eye – and has been from an early age. Three “great books” guided my development as a budding bird artist and biologist – and later carver. First was the Audubon Water Bird Guide. I think many gunners of my generation – I was born in 1953 and the book was first published in 1951 – learned about ducks and geese from this book. Although the dust jacket is now long gone, I can still recall clearly the details from the first edition. Against a blue background was the lower portion of Plate 10 – Don Eckleberry’s fine painting of 3 Ruddies, the hen and the drake – the latter in both winter and summer plumages. 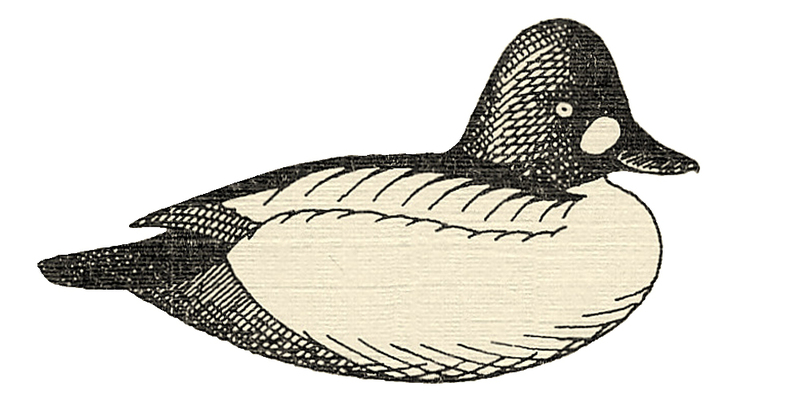 Later – it was first published when I was 10 – came Ducks at a Distance – the ID booklet published by Interior in 1963. I still like the original, green-covered version best. It was Bob Hines’ drawings and paintings that grabbed me. I probably copied most of them – often more than once – when I was a kid. His depiction on page 15 of the Ruddy taxiing over the water was one I drew and painted and inked. 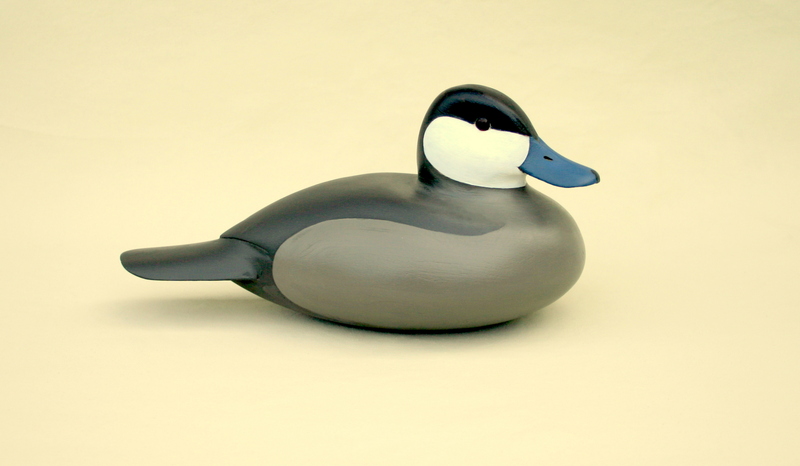 But, it was Joel Barber’s Wild Fowl Decoys that set me on a path toward carving. I did not own a copy for many years but, when I first brought it home from the East Islip Public Library, I was smitten. 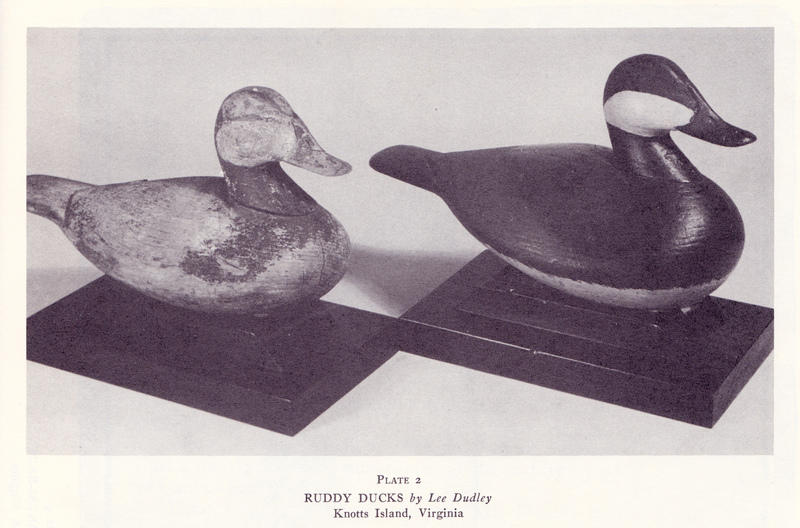 Of course – like almost everyone who is drawn to the floating wooden sculpture we call decoys – I was transfixed by the two decoys in Plate 2. Ruddy Ducks by Lee Dudley, Knotts Island, Virginia. To my eye, both the worn bird on the left and the tarted-up, fresh paint bird on the right are perfect objects – they do what a decoy should do and nothing at all should be changed. These images are with me every time I carve and paint. I have only carved a couple. The Drake Ruddy above I carved for my wife Susan. I chose this species because the first one I carved – for a collector of Ruddies – gave me the feeling I want whenever I carve a bird. I want to see the personality of the species – at least as I perceive it – and I want the form and shapes and colors to work together as a piece of art. I tried to follow Mr. Dudley’s lead and kept the oil paint scheme very simple. No individual feathers or tracts – but still my usual fair curves, hard edges and organic shapes on a voluptuous, round-bottomed form. To emphasize one other trait – that bespeaks, I hope, the requisite care and workmanship – I hollowed the body with extra care. The walls are about one-quarter-inch thin – and the postage scale says this Ruddy weighs just 7 ounces.